Maruti Suzuki Ritz is one of the popular car of Maruti Suzuki, the car have great and elegant look with world class technology and advanced features. It is available in both petrol and diesel version. Appearance: The chrome finished logo of the company in the front looks very stylish. The boomerang tail lights offer very distinctive look and also merge well with the aerodynamic design. The car has front and rear fog lamps. The body colored bumpers give the car more dynamic exterior. The alloy wheels, the colored outside door handles and colored door mirror offers the extra bit of finishing touch. Comfort: The seat height adjuster allows lateral movement, reclining movement and adjustments of the seat. The tilt power steering and the front and rear seat head restraint offers a comfortable drive. The car has illuminated steering with audio controls, electric ORVM and power window in both front and rear seat, huge luggage space, cup holders, ticket holders, console box, etc. The car also has other comfort features like remote fuel lid opener, boot lid opener, cigarette lighter, antenna, etc. Engine: The petrol version of Maruti Ritz has1.2 L, 1197 cc K-12 series engine. The engine is endowed with 5 Speed Manual Transmission Gearbox and light weight DOHC (Double Over Head Camshaft) and packed with Bharat Stage IV emission and MPFI (Multi Point Fuel Injection) supply system. It offers great performance by delivering a power of 85 PS at 6000 rpm and a torque of 113 Nm at 4500 rpm. The diesel version of Maruti Ritz has 1.3 L, 1248 cc DDiS engine. It is packed with 5 Speed Manual Transmission Gear Box, 16 valve cylinder head and DOHC valve configuration. The engine offers a maximum power of 75 PS at 4000 rpm and a torque of 190 Nm at 2000 rpm. Safety: The car has Dual front SRS Airbag, ABS (Anti Lock Braking System) with EBD (Electronic Brake Force Distribution), front and rear fog lamps. The intelligent Computerized Anti Theft System (Immobilizer iCATS) provides security against car theft. Some other safety features are child lock and central locking. The above mentioned are lowest approximate price and excludes tax, registration, insurance and cost of accessories. Maruti Ritz is a great product. 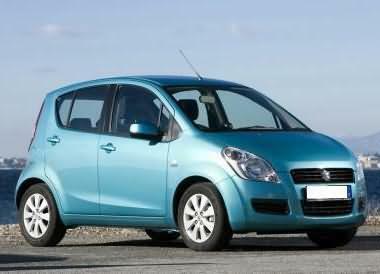 It has got mileage, low maintenance cost, Maruti’s excellent service back up and durable quality of interiors. Initially i test drove all the cars including Ford Figo, but they did not satisfy me, but when I test drove, I immediately felt “Ritz is my choice” because, the K series engine of Ritz is a silent and powerful engine, giving a consistent mileage of 16 kmpl. Figo has less pickup and not so nice interiors. Ritz has uber cool interiors with lots of features and the seats are comfortable too. Go for Ritz, its my advice to you friends! !